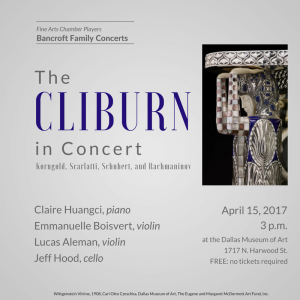 In partnership with the Cliburn in the Community program, Fine Arts Chamber Players is pleased to announce The Cliburn in Concert, the next free Bancroft Family Concert on Saturday, April 15, 2017. Held in the Horchow Auditorium at the Dallas Museum of Art (1717 N. Harwood Street, Dallas 75201), the program begins at 3 p.m. with doors opening at 2:30 p.m. The concert is FREE TO THE PUBLIC with no tickets required. The afternoon’s performers are Claire Huangci, piano, 2013 Cliburn Competition semi-finalist and Jury Discretionary Award recipient; Emmanuelle Boisvert, violin, Associate Concertmaster-Dallas Symphony Orchestra (DSO); Lucas Aleman, DSO violin; and Jeff Hood, DSO cello. The program includes the last movement of Erik Korngold’s dynamic Suite for Piano (Left Hand), Two Violins and Cello. The piece was commissioned by pianist Paul Wittgenstein after losing an arm in World War I. After the concert, audience members are invited to visit the Dallas Museum of Art’s Wittgenstein Vitrine, a jewel-encrusted masterpiece of early 20th century Viennese design, once owned by Paul Wittgenstein’s family. Solo piano works on the program include Domenico Scarlatti’s Four Sonatas, K. 443, 208, 29, and 435; Sergei Prokofiev’s excerpts from Romeo and Juliet; and Johannes Brahms’ Handel Variations, op. 24. Immediately following the performance, audience members are encouraged to stay for CODA: a moderated Q&A conversation with Claire Huangci. No tickets required. General admission to the DMA is also free. 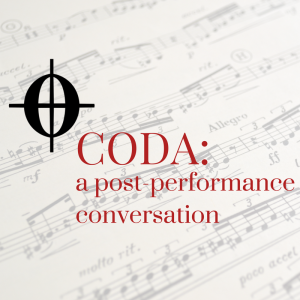 Most Bancroft Family Concerts are now followed by CODA: a moderated post-performance dialogue with the musicians. Get exclusive insight on this month’s Bancroft Family Concert! An accomplished musician, violinist Filip Fenrych has the added feather in his cap of being Jaap van Zweden’s first hire at the Dallas Symphony Orchestra nine years ago. 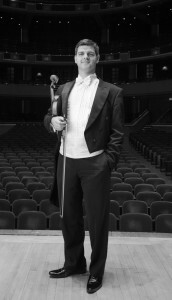 He joins DSO french horn player Kevin Haseltine and concert pianist Dr. Zahari Metchkov on stage this Saturday. As always, the free concert begins at 3 p.m. at the Dallas Museum of Art. Doors to the Horchow Auditorium open at 2:30. Come early to guarantee seating! What piece on the program are you most excited about? What should audience members listen for? Very qood question. I think we’re most excited about playing Brahms, but we have spent so much time learning the Ligeti it’s hard not to feel excited about that. Normally, you would expect to have one piece on a program that you’re excited about, but this time our attention is divided. One piece is so close to the heart (Brahms) and one is so close to the brain (Ligeti) that the analytical aspect of it is another challenge all together. When listening to the Brahms, the audience should know it is a very, very special piece of chamber music. Brahms’ melodies are to die for, really, and the sadness of some of the melodies relates to the death of his mother. It was a piece that was close to him; therefore, the intimacy is palpable. As far as the Ligeti goes – an audience member has to be like a sponge trying to soak up the sounds that are coming at one’s ears. For instance, there are very unexpected intervals played. It can be challenging for an audience member to listen to, actually, but we’re hoping our performance makes it less tough. What do you love about chamber music? How is it different from playing in a large symphony? Playing chamber music is my favorite–absolute favorite–thing to play. It’s the immediacy of communicating ideas with the other performers, the ability to communicate what you individually want to hear and play, versus in a big orchestra you’re told what to play and how to play it. The camaraderie on stage with chamber music is my favorite thing. How old were you when you started playing the violin? Why did you choose it? Did you learn other instruments? I was 6 ½. My dad took me to a classical music concert as my sixth birthday gift. We were on a train for many hours, arrived at the hall, and I was blown away by the music, the soloist, by the hall. When I came home after the concert, I told my parents “that’s what I want to do for the rest of my life.” They didn’t listen at first! But, eventually, I got the violin and started playing. I also learned piano through my public school’s music program in Poland. And we learned recorder! My music teacher said that my violin lessons wouldn’t count for my music credits in school. You will not catch me with a recorder in my hand any more. What type of music did you listen to as a kid? I listened to classical music, and whatever I could get my hands on growing up in communist Poland. I found and listened to some jazz. As a teenager, I came across Depeche Mode, Metallica, and I was a huge fan of Queen. I was trying to listen to things other than classical, but for sure, classical music was the main thing. 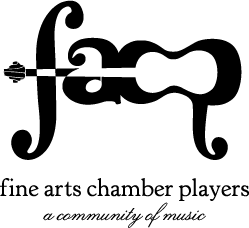 You had the initial idea for this concert program—what was it about these pieces that inspired you to put them together for Fine Arts Chamber Players? Surprisingly, I have never played chamber music with the french horn before. I have played so much string music, but never played with the horn. So, with the original idea to pair violin and french horn, Brahms came up immediately. Then as a companion piece, Ligeti was added to the mix. Who’s your favorite composer to listen to? To play? I enjoy listening to Beethoven a bunch, but I don’t necessarily seek out violin works to listen to – I enjoy listening to Beethoven’s piano sonata, and there’s always Bach! I enjoy his choral music. I think performing Romantic composers are probably closer to my heart and more satisfying. The list isn’t limited to one composer in each category. What’s your favorite sound (musical or non-musical)? Least favorite? My favorite is the ocean. My least favorite is the sound of an alarm, especially a morning alarm (I’m not a morning person). Once you leave this world and reach the pearly gates, what celestial concert are you looking forward to? Because it would be fun, I’d like to see Mozart playing and see if he was actually as funny as we think he was. FACP is now accepting applications for Assistant Festival Director of the 37th annual Basically Beethoven Festival, a paid summer internship position for current undergraduate college students. The Assistant Festival Director oversees major administrative elements of the Festival, including artist relations and event management. Experience in music or arts administration discipline preferred. The dates of the internship are June 5 through July 30, 2017; more details can be found here or below. Foundation. The ExxonMobil Community Summer Jobs Program provides full-time college students with an eight-week paid internship to gain experience in the nonprofit sector. Pianist John Tatum is in his fifth year teaching class piano and private piano lessons through Fine Arts Chamber Players at David W. Carter High School in south Dallas. 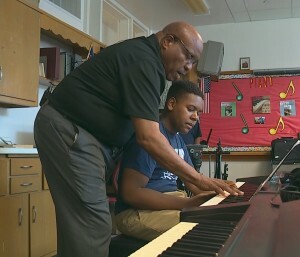 Click here to watch WFAA’s profile on John Tatum’s piano class at DISD’s Carter High School. In addition to teaching for FACP, he maintains a private piano studio, he is an in-demand accompanist for many professional groups and soloists, he is an accompanist at multiple Dallas ISD high schools, and he is the Minister of Music at First Baptist Church of Hamilton Park in Richardson. No, we don’t know how it does it all. But, we do know that he is a tremendous musician! Mr. Tatum has always been around music. He told us about growing up next door to his church. His family would come home on Sundays with church music still in their ears, his mother would sing, and he would “figure it out” on the piano. His mother insisted that all eight (!) of her children have a musical education. Seven of the siblings play the piano (one brother picked up the baritone horn). Mr. Tatum studied piano at East Texas State, which is now Texas A&M-Commerce. How old were you when you started studying piano? I started taking lessons when I was 7, I think. I could play by ear, though, before that. In fact, I can’t remember NOT playing the piano. My older brother played piano and I wanted to take lessons, too. When I started formal lessons, I played everything in my brother’s John Thompson music book by ear for my teacher. Of course, you must learn to read music in order to really study it. My teacher gave me Bartok – well, I almost quit when she put me on his Mikrokosmos series. It was so strange to me: there were no pictures in the books, the titles were in two or three different languages. Everything about it seemed so weird to me at that age! With the Bartok I had to really, really read the music and count. Consequently, when I have students that play by ear, that’s the course of study we use because they have to read the music and count. I attribute my ability to sight read well with studying Bartok. Who is your favorite composer to play? To teach? To play, Rachmaninoff and most Romantic composers. I am also intrigued by Bach; it’s very cerebral. All students must study Bach because college music programs and conservatories demand Bach in auditions because his music shows how you think and how you play. in finding a piano. I’ve bought more pianos off Craigslist for students! A very promising Carter piano student of mine, earned a gold medal at UIL competition this year. Normally, the music teacher on campus holds the medals to present them at one time in front of the whole class. But, this student wanted his immediately so he could wear it around the halls at school. I’m so thankful to FACP having me at Carter, because I can teach students who otherwise wouldn’t have private lessons. I get up at 5:30 in the morning to get down to Carter for lessons, and I’m happy to do that for these kids. Have you taught other ages? In my piano studio, I teach as young as 4 years old and I teach adults, too! In DISD, I work with high schoolers. What is a particularly memorable recital or performance of yours? Late last year, I was performing in northern Europe while three of my former students were performing elsewhere on the continent. They would call me to ask about what they were seeing and to ask about the cultural differences they were experiencing. I had to convince them to not eat at a McDonald’s in France! When I see my students perform on the world’s stage, my heart bursts. That’s my payback, right there. What piece of advice would you give 16-year-old John? Heed the advice of others. Listen more, practice harder, study harder. What’s your favorite sound (musical or non-musical)? Least favorite? My favorite sound is the human voice. It can do things that other instruments can’t do. My least favorite would be an out-of-tune guitar. Hearing that drives me nuts. Once you leave this world and reach the pearly gates, what celestial concert are you looking forward to? I want to hear Mahler’s Symphony No. 8, the “Symphony of a Thousand.” And I want to interview all the greats and hear what they were thinking when they wrote their stuff, like Prokofiev – why is the third movement to his Piano Concerto No. 3 so hard? It’s almost impossible to play. 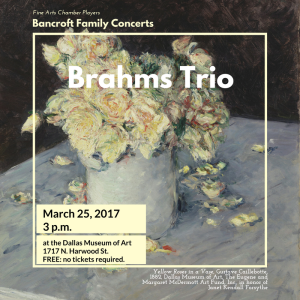 Please join us for Brahms Trio, the next free Bancroft Family Concert on Saturday, March 25, 2017. Held in the Horchow Auditorium at the Dallas Museum of Art, the program begins at 3 p.m. with doors opening at 2:30 p.m.
As always, the concert is FREE TO THE PUBLIC with no tickets required. General admission to the DMA is also free. The afternoon’s performers are Filip Fenrych, violin, Dallas Symphony Orchestra; Kevin Haseltine, french horn, Dallas Symphony Orchestra; and Dr. Zahari Metchkov, piano, Colorado State University-Pueblo faculty. The program includes Johannes Brahms’ Horn Trio in E-flat Major, op. 40, and György Ligeti’s Trio for Violin, Horn and Piano. Brahms composed his piece in 1865 in memory of his mother. Ligeti’s work, written over 100 years later in 1982, is regarded as an homage to Brahms’ trio. The pairing of these divergent pieces brilliantly showcases the musicianship of Haseltine, Fenrych, and Metchkov.